Here's some very early 2010 NFL undrafted free agent signings, with more surely to come. Did anything happen with that defensive back from IUP that everyone on here was talking about? Glad we picked up Andre Dixon. He was one of the players I saw that went undrafted and felt like he could make a roster. Not sure how he fits in with us, but I like the signing. Btw... how the heck did Dorin last til the 7th round? Crazy. The Philadelphia Enquirer is saying Daryll Clark to the 'skins. I know it, I was shocked Nate Byham went before Dickerson. And I actually thought Byham was vastly underrated. I guess is he has no real position. Wannstache used him at like 5 different positions in college. He doesn't block good enough to be an NFL TE. He'll probably be moved to HB like the Steelers did with McHugh. Good for Stull catching on with KC. 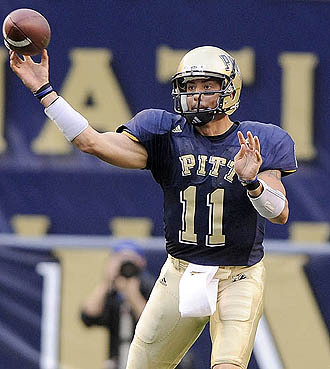 I never really cared for him as Pitt QB but I was embarrassed how the fans were massive jerkwads to him. He seems like a good kid so I hope he gets a shot to be a St. Pierre-like backup. I knew Stull was picked up when I heard a smattering of boos echoing from Heinz Field. Dorin Dickerson was hardly the model of consistency during his time at Pitt, so why would you be shocked no NFL team wanted to draft him? It's not like Pitt plays a lot of top tier college programs on their schedule either. The Big East is pretty much a bunch of crap.